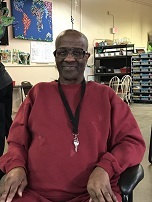 Louis is a materials handler and loves the atmosphere at DSC because he has been able to meet many friends while being productive in a work environment. When Louis is not working he is relaxing in his pajamas at home, where he lives with his sister and loves that they are a happy family. He also loves when his nephews make him coconut cupcakes and talk to him about their days. DSC is another family to Louis and has loved all the people he has worked with. Louis has made some great memories playing the Nerf Gun game with one his managers, Alex. Louis is planning to travel to Ohio for his upcoming birthday to visit is family, and cannot wait to try some Chinese buffets while on vacation. Have fun on your vacation Louis and thank you for all of your hard work!